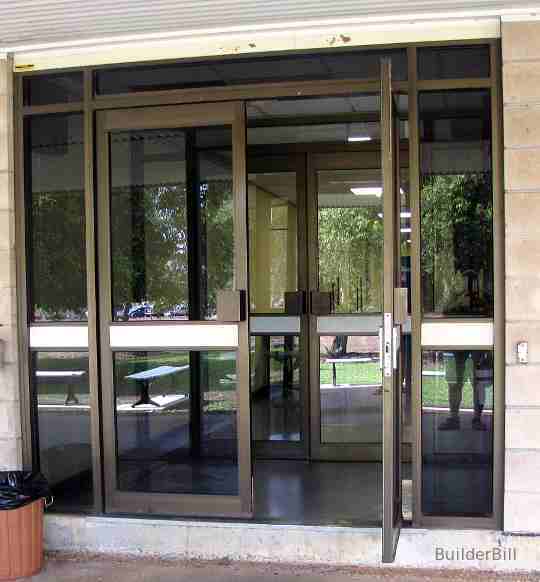 Two sets of doors with a space between to stop the loss of conditioned air. Used almost always in public and semi-public building and where the traffic is heavy, this device is a method of primarily of conserving energy. As in saving cooled or heated air from escaping outside. 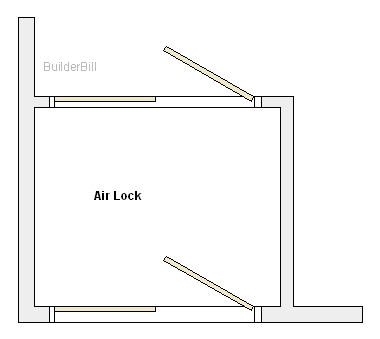 Above is a photo of an external double door leading into an air lock with another set of doors behind it. In this case the interior walls enclosing the ceiling just go up to the ceiling, because it is not very high, but in buildings that have high ceilings then it is normal to put a lower ceiling over the airlock area. 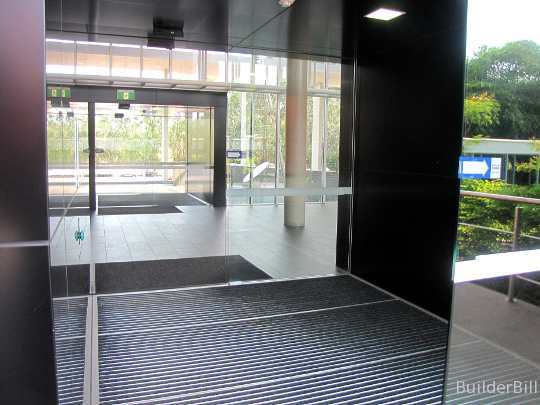 In this photo the doors are automatic glass sliders and they are set to work independently from each other. In some critical cases, like in security or to laboratories and the like then both set of doors can not be opened at the same time. In this photo the ceiling in the locks (there is another identical one on the opposite side of the building) are considerably lower that in the atrium style main inside area. The term of course is used in many cases where conserving air has nothing to do with it. An arrangement of doors like this can be used zoos for stopping the escape of animals. Double sets of security gates are often seen also.